A report based on the deliberations of the Working Group for Higher Education in the 12th Five-Year Plan (2012-17), titled Inclusive and Qualitative Expansion of Higher Education (2011), identified “access and expansion, equity and inclusion, and quality and excellence (p. 2)” as the “triple objective” for Indian higher education in the 12th FYP. Thus, institutes of higher education in India are expected to lay special emphasis on equity, plurality and demographic diversity of faculty and students; and reduce existing disparities by “attracting and facilitating the retention of students from rural and backward areas as well as differently-abled and marginalised social groups (p. 82)”. Those who have argued in favour of making ‘equity and inclusion’ two of the primary objectives of higher education point to the stark variations in the Gross Enrolment Ratio (GER) of different sections of our population in higher education, even after 60-65 years of independence. For instance, according to the 64th round of NSS, as shown in the tables below, the GER for Scheduled Tribe students is close to one fourth of the ‘General’ students; and that of the Scheduled Castes students, about half of the general students. Similarly, while the GER for Urban students stood at 19% in 2007-08, the ratio for rural students was as low as 11%. The above implies that every year we have hundreds of thousands of young men and women entering the portals of higher education with little or no expertise in English which is the predominant medium of instruction at this level.The English proficiency levels among the students belonging to the marginalized sections (SC/ST/OBC/minorities) are known to be even lower than the ‘general’ population . And thus, it has been argued, that the two issues – low GER of the marginalized section and the use of English in Indian higher education – may in fact be intimately interlinked. It is generally agreed that the foundations of the extant (modern) Indian education system were laid by the colonial government in the 18th and 19th centuries. Is it possible, then, that the roots of the two anomalies described above, too, lie in those early years when the blue-print of the colonial education was being negotiated among the various stakeholders ? What role, if any, did the social-structure of the time have to play in this? My primary objectives in this short essay, thus, is to explore whether the educational policies and practices of the 18th and 19th century can help us better understand and explain the issues of (a) the disproportionately low participation of the marginalized section in Indian higher education, and (b) the use of English as the predominant medium of instruction in higher education in India when majority of its students, both in its schools and pre-university colleges, continue to be taught in local languages. European education in India during the 18th and 19th century could be divided into three broad phases. The first phase, which began in the early 18th century and ended in 1813-14, comprised almost entirely of private initiatives (with occasional government interference). The second phase, which lasted between 1814 and 1854 and saw increasing involvement of the British parliament and the East India Company in Indian education, was arguably the most important of the three phases; and, as I will attempt to show later on in the essay, many of the features that continue to characterize the Indian education system were decided in these intervening decades. The rest of the 19th century could be thought of as comprising the third phase, with the year 1882-3 marking an important milestone in this period. 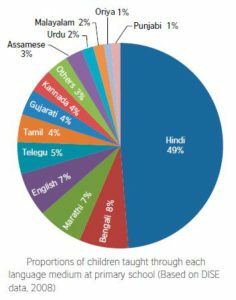 Unlike some other countries which were colonised, India had a comparatively extensive and well-developed educational system, before the coming of the Europeans. And since substantial time, funds, as well as efforts, were spent by the English (and a handful of other European nationalities consisting mainly of the missionaries) in ‘responding’ to the existing education system (as opposed to creating one from the ground up); I will begin in section two, by highlighting some important features of the native education as found by the earliest English researchers. Thereafter, in the three sections which will follow, I will sequentially present some important developments of each of the three phases that are relevant to the object of this essay. And finally, in section six, I will conclude by summarising the key points of the discussion, and highlighting some of the tentative conclusions that may be drawn about the influence of the 18 and 19th century educational practices and policies on the two issues of the higher Indian education discussed above. In 1835, Mr W. Adam was appointed by Lord Bentinck to investigate the state of education in Bengal (and Bihar) province. He produced three detailed reports over the next three years which provide an authentic account of the native education in these regions during the period. As far as the students of these elementary schools were concerned, the situation was only slightly better. In the district of Burdwan, for instance out of the 13,190 students, almost half were from the same three uppermost castes – Brahmin 3,429, Kayastha 1846, Sadgop 1254. About 5% belonged to 16 lowest castes and the rest represented a mix of castes and religions. Moreover, the teaching was completely oral and books or even manuscripts were ‘entirely unknown’. The education, was thus, almost entirely dependent on the skills, inclination and the ‘favours’ of the lone teacher (for there were rarely more than one teacher in a village). The Muslim elementary education was carried out mainly by ‘private tutors’ who was associated with a Muslim family but was allowed to take other students. The medium of instruction was Persian (which was also the language of the courts of law till 1835), and surprisingly, almost half the students in these schools were Hindus – primarily Brahmins or those belonging to the Kayastha caste (Thomas, 1891; p. 12). Moreover, the teaching conducted in the pathsalas were so disconnected with the education in the Tols, that the pre-requisite knowledge had to be obtained by the (mostly Brahmin) students not in the pathsalas but at their home. The proportion of Tols to elementary schools was about 1:3 and only about one-tenth of the students in elementary schools studied in the Tols. The general picture that emerges, thus, is that while the teaching in Hindu elementary education was still dominated by the upper castes, it had passed on from the hands of the Brahmins or priestly class to those of the Kayastha. Moreover, it was mostly designed to meet the needs of the trading and banking communities and perhaps some of the (bigger) agriculturists. And though students from all castes were being taught in these schools (which, Acharya suggests, may have been on account of the Kayastha teachers’ willingness to take students from other communities, and thus improve their income), the student-body consisted of a disproportionate (almost 50%) number of students from the three upper castes. Surprisingly, the three castes put together, also formed the major chunk of the student body in the Persian (elementary) schools. The Hindu ‘higher’ education, on the other hand, which was on the lines of a liberal education (and included studies in grammar, logic, rhetoric, mathematics, and metaphysics), was under the absolute dominance of the Brahmins. Teaching and learning at the elementary level had almost no connection with the education imparted in the Tols – and thus any student seeking admission in the Tols was completely dependent on the favours of Brahmin teachers, who continued to use their hold on higher education to keep up their elevated position in the society. The first phase of the European education chiefly consisted of missionary led activities in various parts of the country. Some of the important issues which emerged in this phase were (a) the place of religious (which was equated to Christian) education in the education of ‘natives’ (b) the provision of teachers and the language to be employed as the medium of instruction, and (c) production of vernacular literature (mainly, translations of the Bible). Despite consistent and notable efforts, the missionaries continued to face significant difficulties; and with limited support from the British government – at the turn of the 18th century it was estimated that less than 1000 students were receiving instructions in European schools (Thomas, 1891). This changed in the early decades of the 19th century but the number of students instructed in their schools, as a proportion of the total students, continued to remain low. Moreover, most students in the missionary schools were usually orphans or those from the lower castes; and the focus was on vernacular education as opposed to education in English. Another example from approximately the first phase – though from three decades later – was the setting up of ‘Hindu College’ at Calcutta. At the initiative of David Hare, in 1816, a number of the prominent Hindus of the city met to found a college for teaching European knowledge – The college, however, was to be reserved for Hindus of ‘good social status’. An initial amount of £11,318 sterling was raised through private contributions which helped in managing it – precariously – through the early years. In 1819 it was endowed by the government with a grant of sterling 25,000 a year; the students, however, continued to come primarily from the upper classes. The College at Calcutta was followed by the establishment of the Sanskrit College at Benares with the supposed purpose of “providing expounders of the Hindu law” and the internal discipline of the college was based on the second and third chapter of the ‘Institutes of Manu’. Thus, we see that the first phase of European involvement was limited, but characterised by, the efforts of the missionaries to impart primarily elementary education in vernacular languages to the lower classes; occasional efforts to set up English schools for the higher classes, and a tilt (in the Company’s administration) towards support for Oriental (i.e. Sanskrit and Arabic) learning. Despite these early pronouncements, the first substantial step was not taken until 1823, when a ‘Committee of Public Instruction’ was appointed, all government supported educational institutions at the time placed under its authority, and it was charged with the disposal of a lakh of rupees per year. The thrust of the Committee continued to be towards supporting (the existing centres of) Oriental higher learning. Another evidence of its support for higher learning was its substantial encouragement for the publication of Oriental books, mainly in Arabic, Persian and Sanskrit. Another important measure taken by the Committee in this period was the establishment of English classes in all the main colleges, in the years 1828-30. This step was immensely successful as was indicated by the increase in enrolment in Benares College in one year from 163 to about 270. It is also worth noting here that close to 90% of the students in Benares College at this time were Brahmins and most others belonged to other upper castes. (Thomas, 1891). Interestingly, among all the institutions that were run by the government during this time, the most successful was considered to be the Hindu College – which was the only one in which European literature and science were ‘the staple of instruction’ and which derived it students mainly from the upper classes. Another relevant fact is that while the Oriental printing press was finding it hard to dispose its books, the School-book Society which had been set up by a committee of ‘English Hindus and Muhammadans’ to provide English textbooks, was doing extremely well and bringing in a profit. The Committee had been regularly overdrawing its funds; and in 1833, the funds at its disposal were increased by an Act of British Parliament from £10,000 to £100,000 a year. The question of how the additional amount was to be utilized became a cause of debate in the 10-membered committee. While one side, 5 members were in favour of continuing to spend bulk of the money in improving and expanding oriental education; the other side argued that no money should be spent any more on Oriental learning. It was amidst this debate that Macaulay arrived in India in 1834 and as a Legislative Member of the Supreme Council wrote the famous minute on 2nd of February 1835. His recommendations were endorsed by the Governor-General at the time: Lord William Bentinck, who issued a proclamation on the 7th of March, which gave a decisive hand to the spread of European education in India, through the medium of English language. Some of the main elements of the proclamation were (1) that the chief aim of the educational policy should be to promote a knowledge of European literature and science: (2) that henceforth no more stipends should be conferred, they serving to encourage obsolete studies (3) that the printing of oriental books should at once cease (4) that the fund thus freed should be employed in promoting European studies through the medium of the English language, and (5) that the Committee should at once submit to Government a scheme for effecting this purpose. Another important point to note here is that new stipends had been cancelled; only competitive scholarships were available – and that too, only to about one-fourth of the total students. This implied that most of the students in these colleges had to pay for what was an expensive education (due in part, to the custom of employing English professors in most departments other than Oriental studies). The (Wood’s) Despatch of 1854 recommended special attention of The Government of India to the improvement and far wider extension of education, both English and vernacular, and prescribed as the means for the attainment of these objects (1) the constitution of a separate department of the administration for education ; (2) the institution of Universities at the presidency towns; (3) the establishment of institutions for training teachers for all classes of schools; (4) the maintenance of the existing Government colleges and high schools and the increase of their number where necessary; (5) the establishment of new middle schools; (6) increased attention to vernacular schools, indigenous schools for elementary education; and (7) the introduction of a system of grants-in-aid. A noteworthy point here is that it was almost unanimously agreed that the elementary education should be provided in vernacular medium. Furthermore, two types of middle school seem to have sprung up – the first type were attached to high schools and were generally attended by students who could, or wished to, continue their education after middle school; and the second type were independent middle school, generally attended by those who did not expect to attend high school. The medium of instruction in high schools varied regionally. Thus while the grant-in-aid system appears to have worked reasonably well for the other types of education, the lack of local support (among the higher classes?) for elementary education in vernacular medium may have limited its growth. Some of the efforts of the government to invest in primary education seems to also have met the resistance of the small but increasingly vocal professional class who were benefitting from the higher education; as was the case, for example when Sir George Campbell declared in the mid-1870s that one of the main aims of his administration was to encourage primary education, in Bengal (ibid, p. 138). The arguments against such attempts often rested on the ‘filtering down theory’. The setting up of the Universities in the year 1857, on the other hand, led to the opening of newer venues for the small and increasingly elite professional classes. “The great aim of the young [mostly upper caste and class] Hindu is to obtain a place in a University examination list” says Thomas (1891), “this being practically the sole public test of proficiency in liberal studies. His ultimate destination is for the most part either the public service or the bar. Out of the 3311 students who obtained degrees between 1871 and 1882, 1244 had in 1882 entered public service, 684 the legal, 225 the medical, and 53 the civic engineering profession.” It was not surprising, given the students that it attracted, that the universities were earning profits in some years just be means of the fees charged to the students. In 1882 a committee was set up to enquire into the “existing state of public instruction, and to suggest means for furthering the system on a popular basis.” One of the arguments against the education department was that “high education was being stimulated beyond the requirements of the country.” However, the privileged position of the higher education remained more or less unchanged till the end of the century. We began the essay by noting two apparent anomalies in the Indian higher education: (a) the disproportionately low participation of the marginalized sections, and (b) the use of English as the preferred medium of instruction in institutions of higher learning, despite the fact that even today no more than 10% of our students study in English medium schools and perhaps no more than 1-2% of the population can use English effectively as a second language. We then raised the issue of whether the roots of these anomalies can be traced to the early years of 18th and 19th century, when the blue-print of the colonial education was being negotiated among the various stakeholders, and whether the social-structure extant at the time had a role to play in this. Thereafter, in section two, we noted some of the essential features of the native education system as was found and reported by the earliest English researchers – highlighting the dominance of the upper castes in elementary education and the monopolization of the Hindu higher education by the priestly (Brahmin) class. In section three, we described some key features of the first phase of the European education in India, starting in the 18th century and extending till 1814 – we noted, for instance, the early efforts of the missionaries and their focus on providing vernacular education to student, who came mainly from the lower classes; and the initial attempts by some private groups and individuals, as well as Company officials, to support English education for the upper classes. Then, in section four, we discussed the second phase (1814-54): the Company’s initial support for Oriental learning, which mainly benefitted those classes already conversant with Sanskrit and Arabic; the setting up of English classes in all major colleges; the decisive shift towards European education in English, in 1835; and the growth of English higher education thereafter. Finally, in section five, we described the last phase extending from 1854 to the end of the 19th century and underscored the important changes brought by the 1854 dispatch – including the recommendations for setting up universities and the spread of elementary education in the vernacular medium for the ‘masses’. We also noted how the success of the efforts to spread elementary education was very limited. It must be noted here that there still exist substantial gaps in our understanding of the Indian education system in the centuries discussed; and there could be, admittedly, more than one way of inter preting the chain of events presented in this essay. However, the following conclusions could perhaps be tentatively but reasonably put forth. There seems to be little doubt that the upper castes dominated the native education system in the 18th/19th centuries. And though there is evidence that the lower castes formed a substantial portion of the student population (more than 50%) at the elementary level; the higher education, was for and by, the upper castes (chiefly the Brahmins). On account of various reasons (such as, very limited support from the English government, and an entrenched caste system which viewed the missionaries as worse than outcastes) the efforts of the missionaries was largely (though not wholly) limited to basic education in the initial years. And since their primary motive was conversion and not necessarily ‘preparing people for the office’ they focussed their efforts in providing vernacular education and translating religious texts in vernacular languages. As the spiritual and educational leaders of the Hindu community, the Brahmins seem to have come in more frequent contact with the English administrators, as compared to many other castes and classes. Whatever may have been the reasons, there is little doubt, however, that the major focus of all initial English efforts towards improvement of Indian education went towards improving ‘higher’ education for the higher classes (as opposed to elementary and middle education for the masses). When the Company undertook to ‘officially’ support Indian education, they encouraged Oriental learning – which primarily benefitted the same class which were already the educational elites and had the ‘cultural, social and symbolic capital’ (if not, or along with, the economic capital) to make use of this education. With the Tols virtually out of access for most other communities, it should not come as a surprise that the Sanskrit college in Benares was overwhelmingly dominated (90%) by the Brahmins in the 1820s. Gradually, English classes were introduced in the Oriental colleges. (It is notable that this was done at the level of higher education; and to some extent in the high schools). However, as these colleges were filled primarily with students from upper classes, this gave the community a relatively convenient ‘bridge’ to English education. The shift to European education in 1830s brought in a new set of students of the ‘upper class’ (as opposed to the upper caste-but-relatively- poorer students of the Oriental colleges) who could afford to pay their way through college (the stipends had been removed and competitive scholarships were difficult to be won for students of the marginalized sections as they could ill afford home support). Thus, though it may not have been so intentioned (and there are some evidences of the English administration actively working to remove the caste barrier in higher education), this change further helped in strengthening the position of the upper classes in higher education. While it may not be accurate to draw any firm conclusions from this essay, about the extent to which the policies and practices of the 18th and 19th century may have affected the Indian education system post-independence (and perhaps, continues to affect it even now) – especially as regards two issues mentioned above – it does perhaps hint strongly at a possible relationship between them. The focus on higher education – which continues to cater to a very small group of well educated, mostly upper class, urban, elites – has been consistently high since independence, whereas the Government elementary education has remained (with the exception of the last 10-12 years) largely neglected. Could this be because the higher classes of today have no use of the Government elementary education? Is part of the reason why English continues to be the predominant medium of instruction in higher education that, as Velaskar (2005) argues, it is part of “the mechanisms through which educational stratification serves the dominant and influential caste, class and political interests and subverts the interests of the oppressed?” No simple answers can perhaps be found, but further exploration of the history of Indian education can provide us with interesting and valuable insights. It is perhaps in recognizing of this that UGC recommends that “authorities would initiate measures, depending upon the need pattern of newly admitted SC, ST, OBC and minority students, to organise remedial or bridge courses in language, communication, subject competency etc.” (UGC Report on 11th FYP, 2011) However, the extent to which this recommendation had been adhered to, and the quality and effectiveness of such remedial courses, remains largely unknown. Mahmood, S. (1895) A History of English Education in India: 1781 to 1893. Published by: The Honorary Secretary of the MAO College, Aligarh. Thomas, F.W. (1891) The History And Prospects Of British Education In India. Deighton Bell And Co., Cambridge.